Be the first to share your favorite memory, photo or story of Allan . This memorial page is dedicated for family, friends and future generations to celebrate the life of their loved one. Allan Howard Erickson passed away July 22, 2018 at St. Mary’s Hospital in Duluth, MN after suffering a massive brain bleed at his favorite place on Earth the family cabin. Al was born on April 4th 1947 in Eau Claire, WI to Howard and Joyce (Klungseth) Erickson. He attend Eau Claire schools and graduated from Memorial High School in 1965. 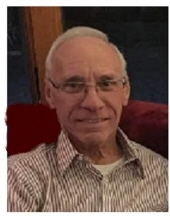 Immediately following his graduation Al started his 42 year career with Finley Engineering Company, in Altoona, WI, as a Sr. Telephone Engineering Technician, retiring in 2010. He proudly served his country in the Vietnam War from 1966-68. On Dec 9th 1972. Al married the love of his life, Jeanne Wolf, in Eau Claire. Al and Jeanne were blessed with 2 children, Felicia and Ryan. Second only to his family, Al’s most pride possession was his family lake cabin known as Togi-Bay on Nelson Lake in Hayward, WI. Originally purchased by his dad, 5 uncles and 1 aunt in 1953, Al and Jeanne bought out the remaining 6 of 7 original owners in 1996, allowing for the cabin to remain in the Erickson Family for the 4th generation. At Togi-Bay Al enjoyed hunting, fishing, ATVing, snowmobiling (always Arctic Cat Green), and boating. Al never missed a Happy Hour at his favorite bar The Nelson Lake Landing where he took pride in being called everyone’s favorite family. Al had an unprecedented ability to be frugal, rarely spending money on unnecessary things. He was a notorious list maker and found great joy in crossing items off his list. He was a tough lover, a hard worker and could fix anything, never hiring anyone to do his projects, an ability that passed along to his son. Last winter, Al and Jeanne celebrated their 45th wedding anniversary with a family trip to Hawaii. Al loved vacationing with his family in their motor home. The family was blessed to take many trips together. Al is survived by his bride of 45 years, Jeanne, his daughter Felicia Erickson and his son and best friend Ryan Erickson. Grandsons Gavin Erickson-Rubenzer and Howard Erickson. Brother –in- Law Ken Rudolphson. Niece Amy (Paul) Clark and Nephew Troy (Sheila) Isaacson. Great Nieces Whitney (Chad) Emerson and their son Shawn, Ashley Isaacson and Taylor Schraeder. Great Nephew Austin Isaacson. Sister- in- laws Diane Burdick, Sue (Tim) Lippold and Mary Beth (Mike) Pierce. He is preceded in death by Father and Mother, Sister Marie Rudolphson. Brother- in- laws Dan Burdick and Tom Wolf. Multiple aunts, uncles and cousins including the original 7 owners of Togi-Bay and His 2 beloved dogs Bandit and Dixie. A Celebration of Al’s life will be Saturday July 28, 2018 at Stokes, Prock and Mundt Funeral Chapel, 535 Hillcrest Parkway in Altoona, WI. Visitation from 3-5pm, service at 5pm with Pizza and refreshments to follow. A private family burial will be held a later date. A special thank you to the staff at Hayward Hospital and St. Mary’s Hospital in Duluth for the care provided. Stokes, Prock, and Mundt Funeral Chapel is serving the family. Online condolences can be shared at www.stokesprockandmundt.com. "Email Address" would like to share the life celebration of Allan Howard Erickson. Click on the "link" to go to share a favorite memory or leave a condolence message for the family.